I’ve more or less stopped doing these full-season reviews of TV shows, on the general grounds they take time and effort, and I’m quite lazy – plus there’s always What Have You Been Watching? on Fridays to do brief reviews. But the first season of Rubicon, I think, is quite an instructive piece of TV, and what with it coming to BBC4 soon, I thought I’d go over some of the things that make it interesting and worth watching, and what it teaches us about US television production. I’ll avoid spoilering anyone who has yet to see it because they’re waiting for it on BBC4. Three episodes into No Ordinary Family and I can’t help but feel that despite being one of the better shows of the new Fall season, it’s actually quite… ordinary. After a first episode that was quite fun and and had a few cool moments, we charged into episode two where things continued to look promising. There was nothing too exceptional: the kids with the “could be interesting if used well but not here” powers just sort of milled around high school trying to learn how to deal with their new powers: daughter doesn’t want to read everyone‘s mind, while son is busily trying to avoid revealing to anyone – including his equally super-powered parents – that he has a super brain now. Daddy (Michael Chiklis) is learning how to use his new powers for surely the only fun point of the show, fighting crime, while Mommy (Julie Benz) just wishes it would all go away, at least once she’s finished researching it. It wasn’t awesome, but it was okay, and the ongoing plot of the super-villains trying to work out if there are superheroes was actually quite nasty and well executed. Episode three, however, was very ordinary indeed. Son wants daughter to find out if a girl fancies him; daughter wants to have a friend to talk to; mom wants to avoid being found out at work; dad wants to fight crime. But interspersed with that, we get the son pretending to be Jewish; dad and mom trying to get their teenage daughter to be friends with their friends so they’ll have someone to talk to; and black best friend of Chiklis trying to teach him to dance. Actual excitement was a little harder to find, despite the robberies in episode three. For superheroes, there’s not much heroics going on, it has to be said. While Benz and Chiklis’s superpowers are CGI-ed relatively well (Benz’s better than Chiklis’s), they’re not really being used much. All most people really want is to see some fun superfights with a backdrop of family problems; what we’re getting is family problems with the very occasional backdrop of fun superfights. Chiklis’s character is the only one enjoying himself, with Benz just being long-suffering, and it doesn’t really feel like an ordinary family. All the same, I’m going to say there’s no harm in watching this. Don’t expect awesome or outstanding. Don’t expect anything truly new or original. But it’s family fun that never really sinks into anything terribly bad. Rob’s prediction: Will last at least a season, unless it forgets it needs to be interesting within the next few episodes. It’s a good job that the Carusometer is such a fault-tolerant instrument of detection. Were it not so robustly built, it would have passed a straight five on every episode of Better With You, thanks to the cringe-worthy studio audience that not only blots out all the jokes with its laughter, but forces the actors to over-act something colossal. Yet Better With You is easily the funniest of this season’s new comedies. It’s very traditional: it’s multi-camera with, yes, a studio audience; it’s an ensemble of characters delivering one liners, with very few guest actors; the characters are largely thick as two short planks; most of the jokes are about well-trod relationship issues and make you feel like you’re still trapped in 1995. But despite that traditional quality, it’s funny. 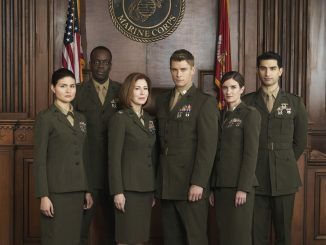 The dialogue’s good, the cast are good, it can be quite sweet (episode two’s "firehouse vision scene", for example), it does touch on the occasional deeper topic (episode three, for example, hinges on a family Christmas card and whether elder daughter’s boyfriend of nine years qualifies as family or not because he’s not married to her) and it never veers into anything too vicious (cf Rules of Engagement). It’s just you have to survive all those traditional qualities to get to the funny. I’m not sure I’d entirely recommend it, since there really isn’t that much new going on here. But it’s very likable and you are guaranteed laughs with it. What more should you ask of a comedy? Three episodes in and there’s just a chance that Running Wilde is finding its feet. After a shaky start that was largely redeemed by Peter Serafinowicz, episode two proved to be not quite as funny – indeed, "pretty bad" would be a good summary with Peter Serafinowicz being the episode’s only good feature. But now episode three has shown up on our collective doorsteps and while we’re still not in hysterical territory, this was actually quite a funny episode – even if most of that funny was, you guessed it, thanks to Peter Serafinowicz and despite KFC having possibly the biggest, most obvious smack-to-the-face bit of product placement since the 1950s. The show’s main difficulty is Keri Russell’s character. If your character is essentially a humorless green activist, be not surprised if that character doesn’t raise many laughs. Episode three showed us the problem wasn’t Russell, since here we had her character temporarily turn evil and be very funny. Arnett’s not quite hitting the comedy highs we know he’s capable of, and where he does succeed, it’s when he’s with Serafinowicz, who manages to make every line he delivers funny – when the line is actually funny (eg when he’s offering vodka to small children) it’s even better. So there’s a chance that the series is settling down now. It’s still not the funniest new show on the box and unless Russell’s character gets a revamp some time soon, it probably never will be. But it is the sharpest new comedy and has enough signs of promise that I’m going to stick with it, even if it’s likely to get cancelled soon thanks to poor ratings. But that might just be because of Peter Serafinowicz.